Networks Raise Money for Education | Broadcast Public Service: Local Stations. Big Impact. 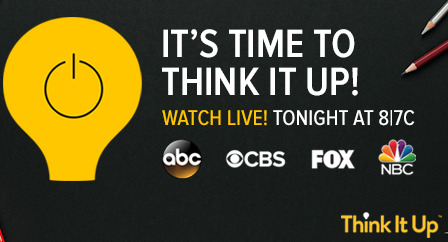 ABC, CBS, Fox and NBC aired The Entertainment Industry Foundation’s (EIC) one-hour Think It Up program on Sept. 11. The Think It Up initiative aims to build excitement for learning in classrooms around the country through celebrity endorsements and by showcasing positive stories from students and teachers. Kristen Bell, Matthew McConaughey, Ryan Seacrest, Jessica Williams, Jeremy Renner, Stephen Colbert, Scarlett Johansson and Gwyneth Paltrow participated in the show, which included sketches and musical performances. Watch Justin Bieber’s telethon performance here.